One of the best memes in recent memory is the above picture of Young Thug and Lil Durk in the studio, the former looking intently at a computer screen with a furrowed brow and the latter with a wide-eyed stare. Clever internet people have imagined that the screen is showing internet games of their youths, Lil Durk's report card, and more. The two were actually tracking vocals, which might seem sort of obvious considering the studio setting. (In repsonse to a DM from The FADER about what they were looking at, Lil Durk wrote, "Pro Tools.") But what you might not know is Young Thug is extremely proficient behind the boards and his skills as an engineer have only grown as his career has progressed. 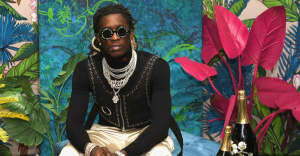 "Since I don't record him as much, he finds it easier to make arrangement changes himself than to try to explain it all to an engineer he's less familiar with," Alex Tumay, Thug's longtime engineer, told The FADER. "So I'm sure he was actually moving vocals around and getting the timing right/arrangement right. He's also gotten pretty proficient with volume automation." And there you have it. Here are some more memes.